That Netflix ‘killer’ from Dish Networks? Not so much. For the past week or so there had been a persistent rumor that Dish Networks, in tandem with its Blockbuster acquisition, had smelled blood in the water following some missteps by Netflix and decided it was time to launch their supposed Netflix killer service. The only problem it isn’t so much of a killer. Called the Blockbuster Movie Pass it was thought that the service would capitalize on the anti-Netflix sentiment following the company’s splitting of its DVD and streaming businesses. Right off the bat though Dish made it quite apparent that it had no intention of being a true Netflix competitor when it became clear that the Movie Pass service was tied to Dish’s pay TV business. 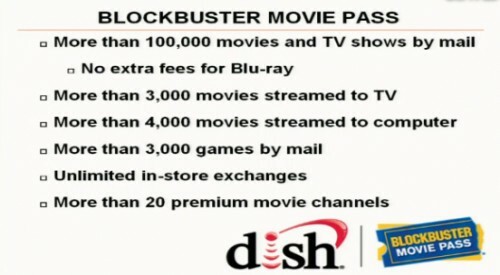 Apparently the new Blockbuster Movie Pass service will be available for $10 a month and will give members access to 100,000 DVD titles and 4,000 streaming titles; but here’s the catch – you can’t get it separately. You have to get the new service as an add-on to your existing Dish Network account. Like I said – this is nowhere near being a Netflix killer. In fact it’s a joke and the fact that tech pundits thought that a company that is so reliant on the largess of content creators and television networks would even go down a Netflix model road only show how wrapped up tech and new media pundits are in their own little world. Personally I am not the least bit surprised by this lackluster offering from Dish and really Netflix doesn’t have a thing to worry about, with the exception of their own facepalms. The biggest complaint I have heard is how much people like the VOD from cable providers rather than DISH Network all the years I have worked there. Blockbuster is the “better than” solution to VOD because not only is the service inclusive of all content but it is added for free to an already existing package that DISH had which cost $10 for 20 movie channels. It’s cheaper than other premium channels like HBO and gives more content which I like. It’s all about “one-stop-shopping” for entertainment which is what DISH is trying to provide.